NS3 is one of the most awesome and brilliant opens source software developed till now. It is awesome for laboratory work and especially for those giving Cisco certification exams this is a boon as now they don’t have to spend thousands of dollars on cisco equipment. 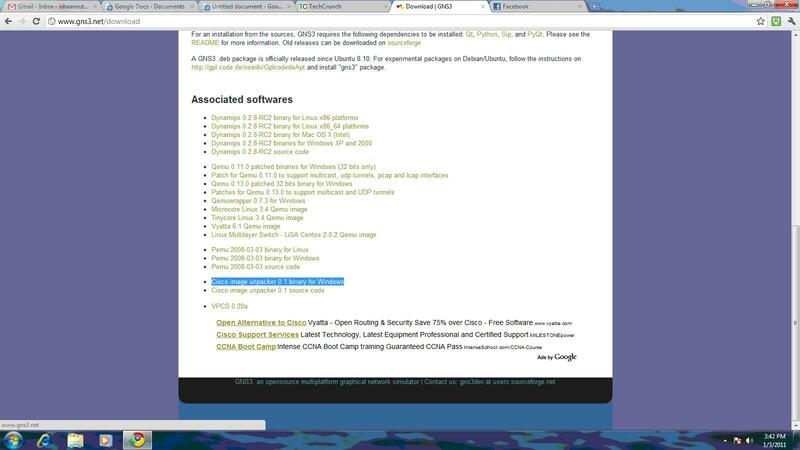 GNS3 is an emulator and not simulator. It actually sends packets between the routers rather than just simulating and the most awesome thing is that you can capture this packets using a packet sniffing software like wireshark and study those packets in detail. I am writing this blog because it took me more than 5 hours just to install and get it started working properly. It takes a little bit of time and patience before u can start using it full flegedly. 1. 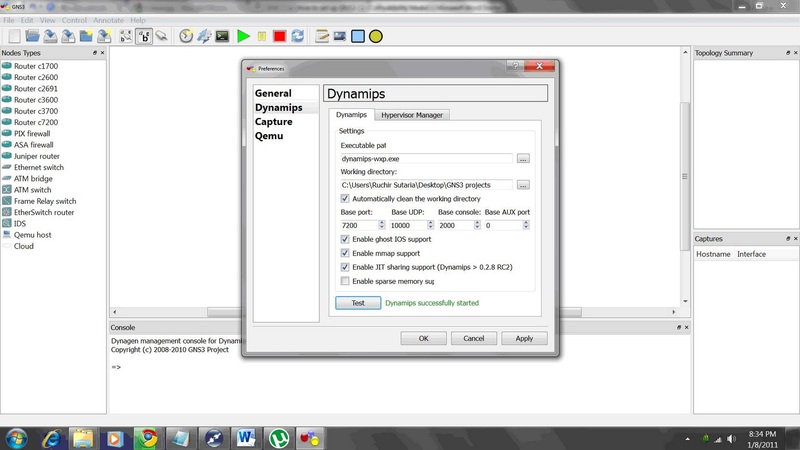 GNS3 is an open source and you can download the software easily by following the link given. The ttp://www.gns3.net/. You Should download the windows all in one as you will get dynamips and all the other required software with i One thing while downloading the software make sure that you download the cisco image unpacker binary as highlighted in the picture. It will be useful afterwards when we install the cisco IOS. 2. Open the downloaded file and install GNS3 its pretty straightforward and does not require any help in doing so. 3. After installing click on the icon of GNS3 that should be visible now that you have installed the software. ON starting a window pops up that has two steps select the first step where you can get your basic configurations for GNS3 setup done. 4. Once you selected step 1 a screen will show up giving you different options and settings. 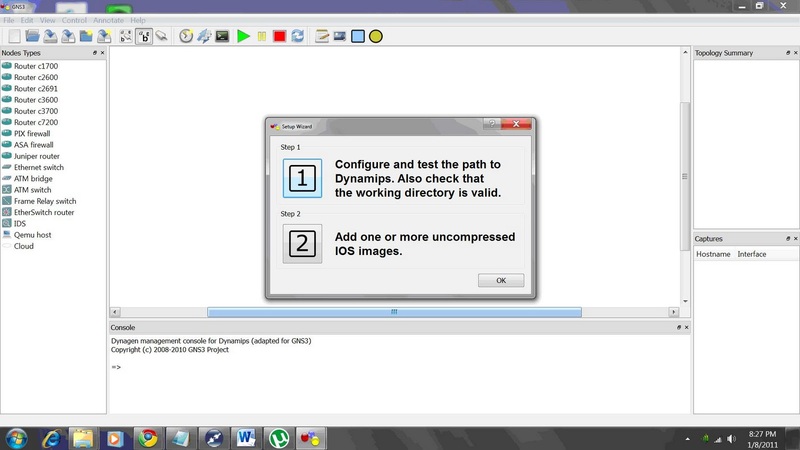 On the left side select dynamips and first of all change the folder settings from the temporary folder to a new folder where you will want to save your GNS3 projects. After doing that just press the test button at the bottom of the screen and see if its working properly or not. Your screen should somewhat look like this. 5. 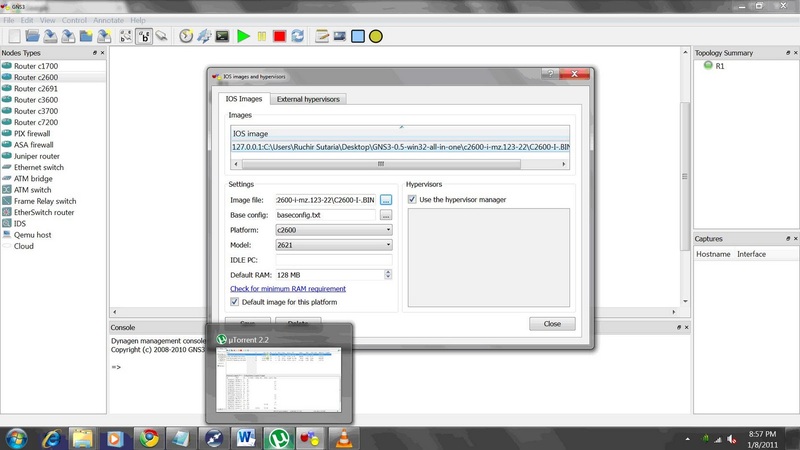 Once that is done you can go to the next step that is adding the Cisco IOS images . This is probably a difficult part and you can get an IOS from a Cisco switch using a falsh drive or yu can download it or buy it from the cisco site. After downloading the Cisco IOS use the Cisco image unpacker to unpack the IOS or use WinZip which works equally fine. Just add it to WinZip and extract the file. The size of the file increases to almost double. Do not use the IOS without unpacking t otherwise you the routers in the GNS3 will take ages to start. 7. Once you are done with this you are ready to use your GNS3 make sure to enable the Idle PC value once you start using the software. ENJOY!!!! This entry was posted in Installation. Bookmark the permalink. Why do we need database normalization?